Did you know how you stand is just as important as avoiding excessive sitting? Static standing all day is not much better than static sitting according to Alan Hedge, a professor in the Department of Design and Environment Analysis at Cornell University. “If what you’re doing is replacing sitting with standing, you’re not actually doing your body any favors,” he says. Cornell's Dr. Alan Hedge puts it this way, “If you go from sitting to standing and vice versa frequently throughout the day … that completely eradicates any of the supposed risk factors associated with sitting, or indeed with standing.” Blood circulation can be hindered in both positions if the body remains static or substantially still. Maintaining consistent blood flow through the circulatory system from and to the heart is key to offsetting fatigue in either position. Despite his findings that moving from a sitting to standing position and back again, removes most of the problem, Dr Hedge still recommends frequent, brief, walking breaks. The human body was designed for almost constant movement. When walking, the weight is shifted and the muscles are contracting keeping the blood flowing during movement. Standing still too long can hinder blood flow - as can often happen at a standing work station for a computer work. The key is to move or contract enough of your muscles to help pump blood freely from the lower body to the upper body and the heart. Unfortunately, frequent walking breaks can have a negative effect on work productivity if it becomes distracting and disruptive. "Consciousness is only possible through change; change is only possible through movement." What type to get? Mats that provide support but allow the worker to make numerous small subtle movements are superior to those that are firmly resilient. Resilient mats are great for providing additional support to the standing user, but do not necessarily encourage enough movement to maintain good blood flow. Static standing on an anti-fatigue mat is simply remaining in a more comfortable ‘sedentary’ position - no different than being comfortable in a higher quality chair. Movement is the key to maintaining blood flow and offsetting the onset of fatigue in any position. The better an anti-fatigue mat is at allowing a worker to shift their weight and readily move on the mat itself, the longer a worker may remain in the standing position. The Wurf stimulates and encourages your body to make subtle movements while standing. The bounciness of the Wurf permits greater ability to shift and move, and flex the muscles; and therefore counteracts the negative effects of static standing –it is thicker and springier than other solutions. It is light and firm yet easy to move, which makes the transition from sitting to standing back to sitting easier and more likely to occur. A heavier cushioned mat can be cumbersome to move in comparison to the newer Wurf design. 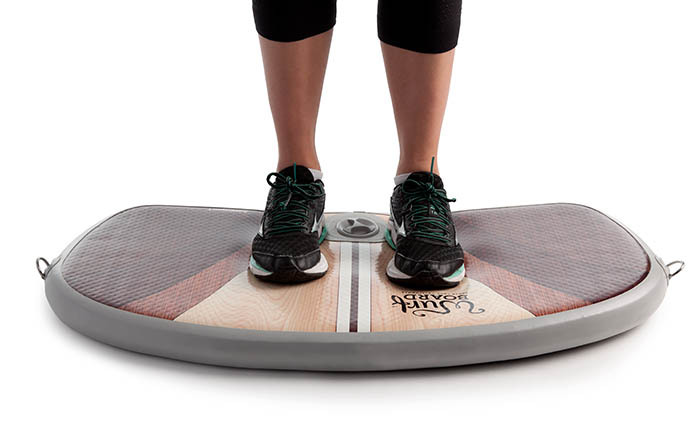 As a result, users are able to stand much longer on the Wurf Board than standard anti-fatigue mats. In their book, The 12 Factors of Business Success: Discover, Develop and Leverage Your Strengths, the authors discuss the problem of work productivity and recommend that workers should work in a focused manner for 60-90 minutes at a time to be productive at work. They also recommend minibreaks between these periods of time where one walks and moves. 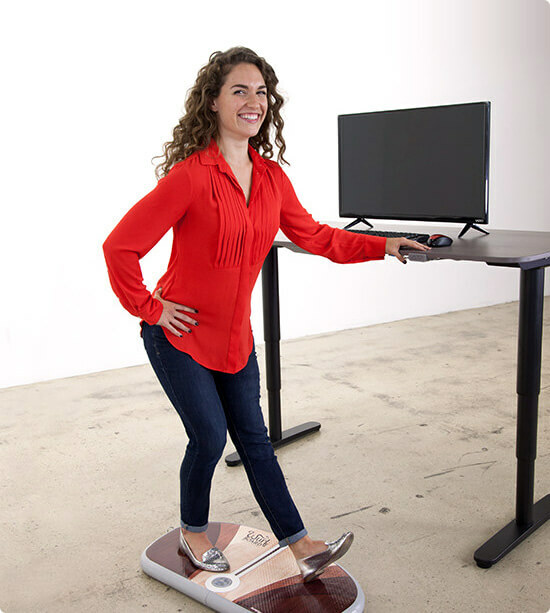 Rather than taking walking breaks, moving from sitting to standing helps function as a very small mini-break that keeps you in, rather than remove you from the work environment. It is easy to see why sit/stand desks are becoming an increasingly popular response to the problem of improving and maintaining employee health while minimizing productivity distractions. 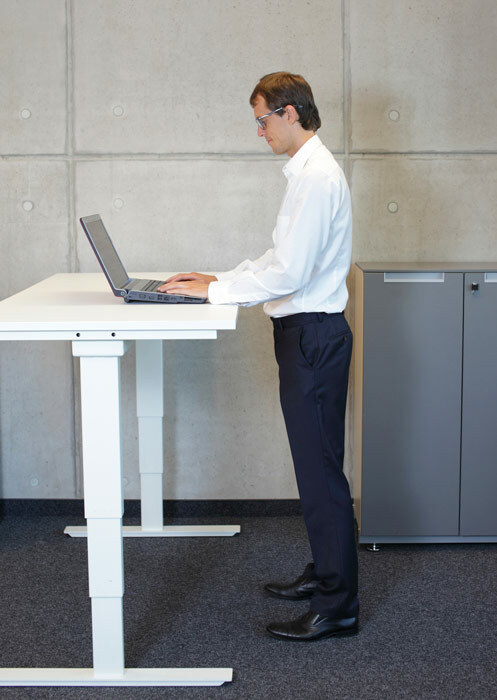 Sit/stand desks have permitted workers to reduce their static sitting while still being able to remain working at their desk without needing to go for a walk. Improving the sit/stand experience for workers can improve worker comfort, health and productivity. Moving the office to an active standing environment works! Use a sit/stand desk and get to the point where you are standing a third of the time and sitting for two thirds of the time. The goal is to periodically sit and then stand and then sit throughout the work day. Set a timer on an hourly or more basis to take a brief walk; and set a timer for that walk to be less than five minutes so that you get back on task with minimal disruption. When sitting, use a good chair that supports the body in an ergonomically sound position. Other types of chairs are kneeling chairs, inflated ball chairs, or stools. Try using a footstool so that you may alter your sitting position by changing your foot elevation and support. Learn and employ stretching exercises and movements that you can do for your neck and back and shoulders while sitting. When standing, use an anti-fatigue mat underfoot. Mats provide cushioning underfoot that will provide additional support and comfort, which will in turn, allow you to stand longer than when standing on the floor without a mat. ©Copyright JumpSport, Inc. All rights reserved.